"Of all the mantras, the supreme and the most potent power of powers is the great, glorious Gâyatrî Mantra. It is only one's faith and purity of heart that really count. Indeed, Gâyatrî is an impregnable spiritual armor, a veritable fortress, that guards and protects its votary, which transforms him into the divine, and blesses him with the brilliant light of the highest spiritual illumination. It is universally applicable, for it is nothing but an earnest prayer for Light, addressed to the Supreme Almighty Spirit" (Sri Aurobindo, Hymns to the Mystic Fire). 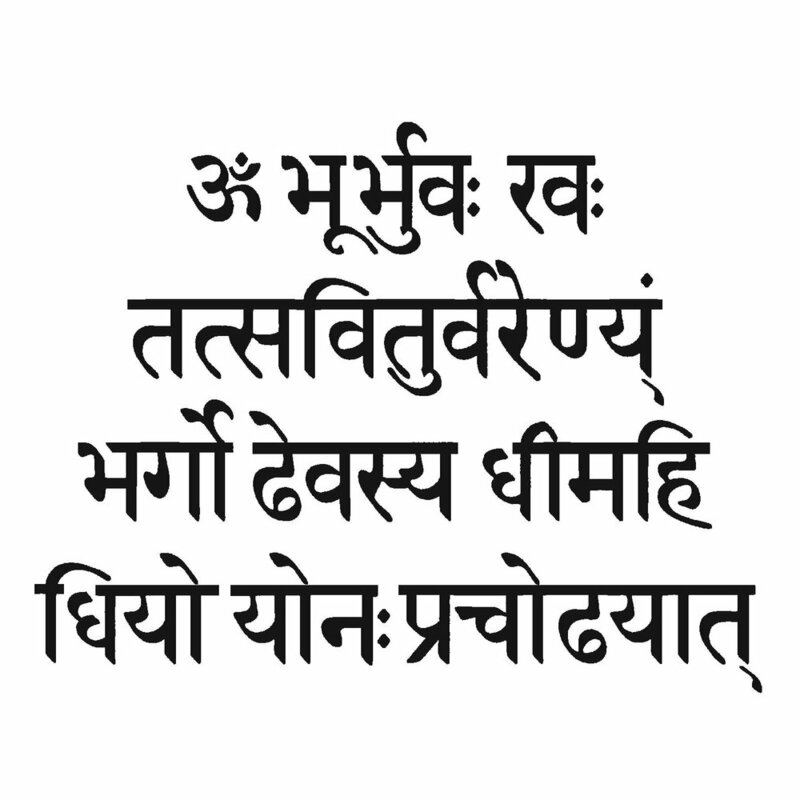 A common and potent accompaniment to the traditional Surya Namaskar or Sun Salutation practice, the Gayatri Mantra is preceded by “the great utterance,” aum bhūr bhuva sva, invoking the primeval sound of All that is One (om), earth (bhūr), air (bhuva), and heaven (sva). Earth, air, and heaven, or in some translations, earth, sky, and space, are symbolic representations of being, consciousness, bliss (sat, chit, ananda) or the gross, subtle and causal realms of ultimate reality. Within the microcosm of a human being, from one’s soles to one’s navel is earth (bhur), from navel to throat is air or atmosphere (bhuva), and from throat to crown of head is svaha (heaven or space). "May the Supreme Light that illuminates the three worlds also illuminate our intellect to the path of luminous virtue." “We recognize the glory of the Light that illuminates the three planes of experience: the physical, astral and celestial. Let us meditate on the sacred Light of the effulgent source that shines within us. Let that inspire our thoughts and awaken the Self as the Light that pervades the entire Universe." “O splendid and playful sun, we offer this prayer to thee; enlighten this craving mind; be our protector; may the radiance of the divine ruler guide our destiny; wise men salute your magnificence with oblations and words of praise."